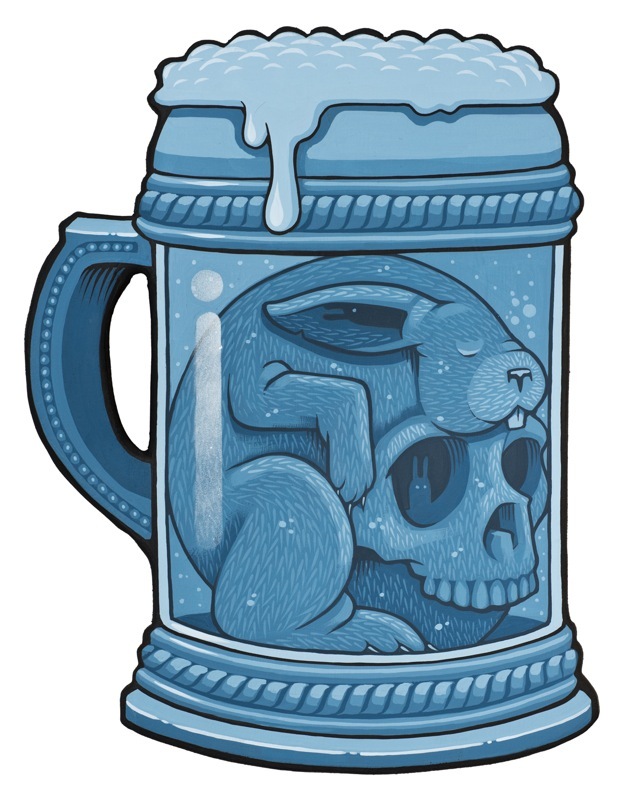 The Brews Brothers will never get caught. 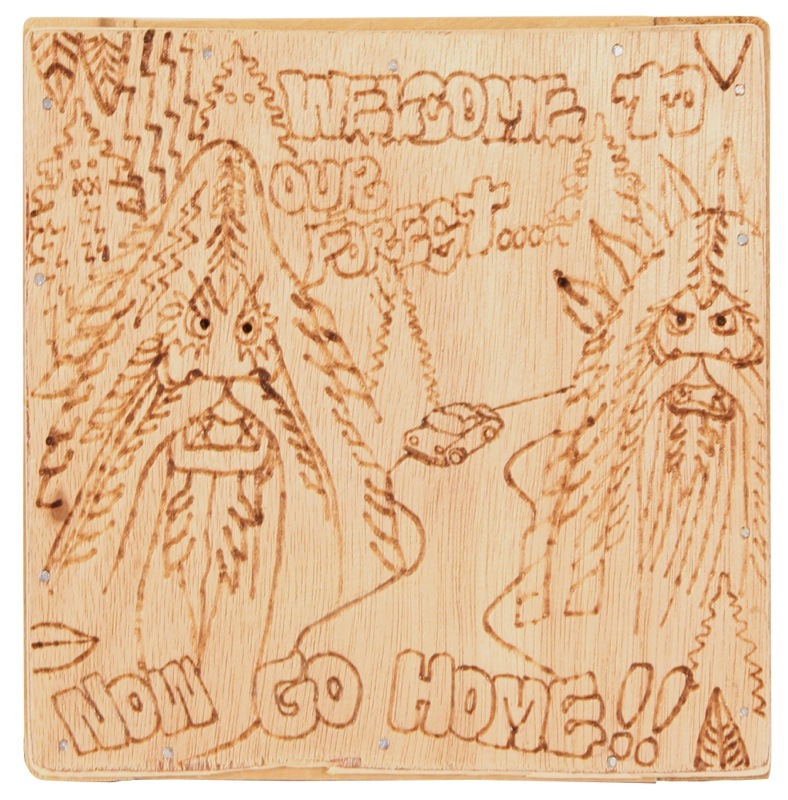 They're on a mission from California. 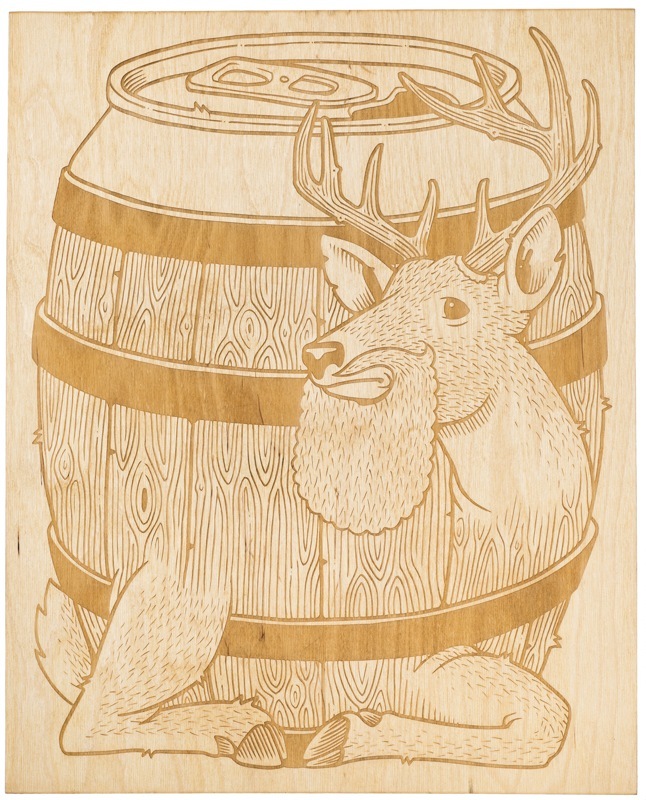 Three artists and long time friends, all from California, join us for their very first exhibit together and form a new art supergroup...The Brews Brothers! 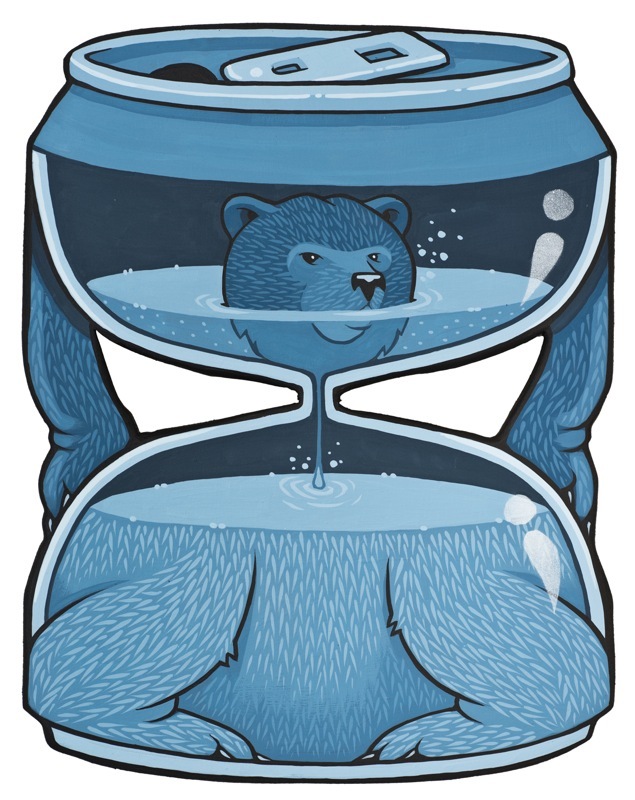 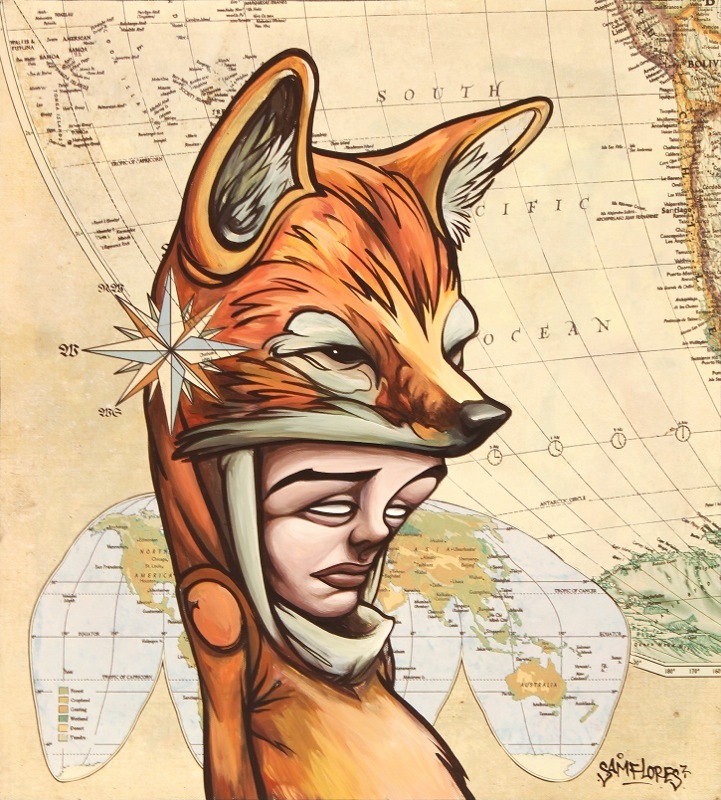 Jeremy Dan Fish, born in Albany New York, 1974. 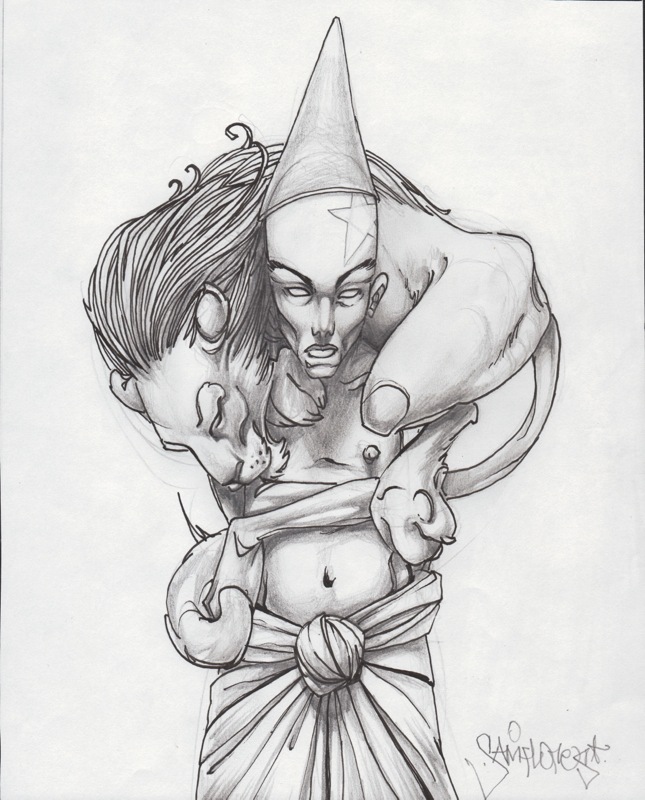 Born in 1975 and originally hailing from Albuquerque, New Mexico. 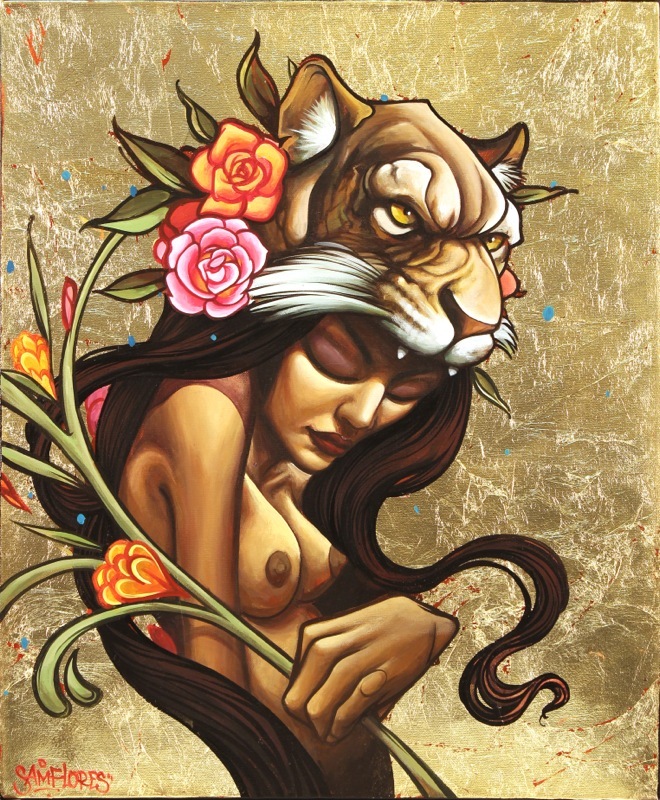 Flores grew up immersed in the vastness of the Southwestern desert, spending his time as a youth skating, drawing and honing his graffiti skills (his moniker being Tiger). 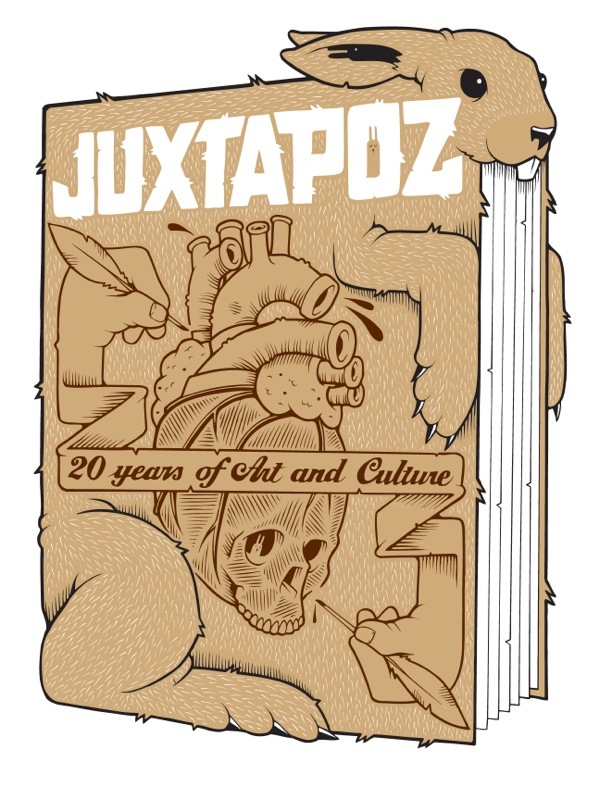 He is uniquely noted for being an autodidact, or self taught artist, having no formal institutional training. 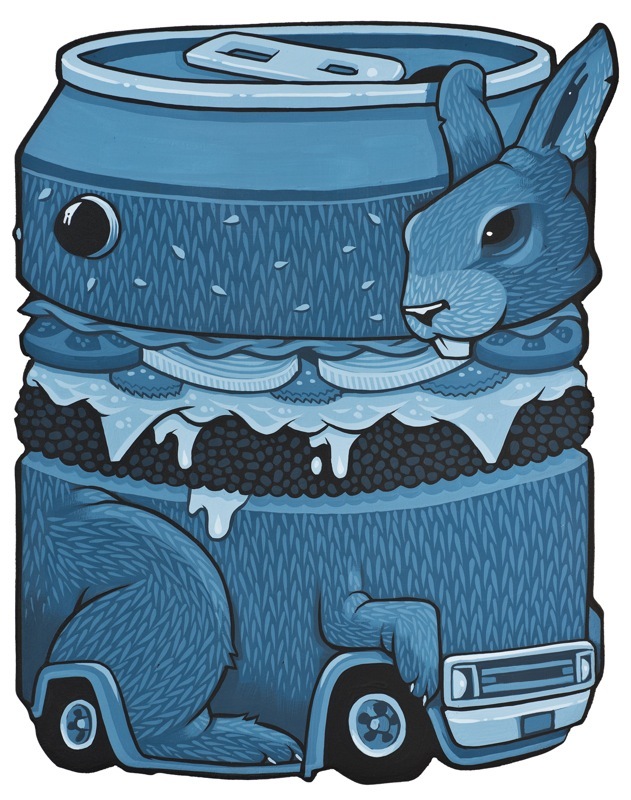 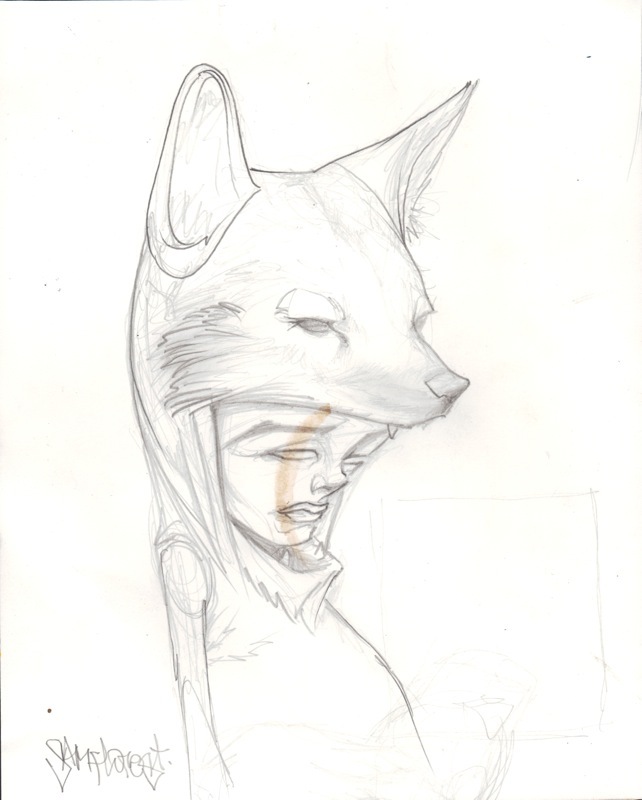 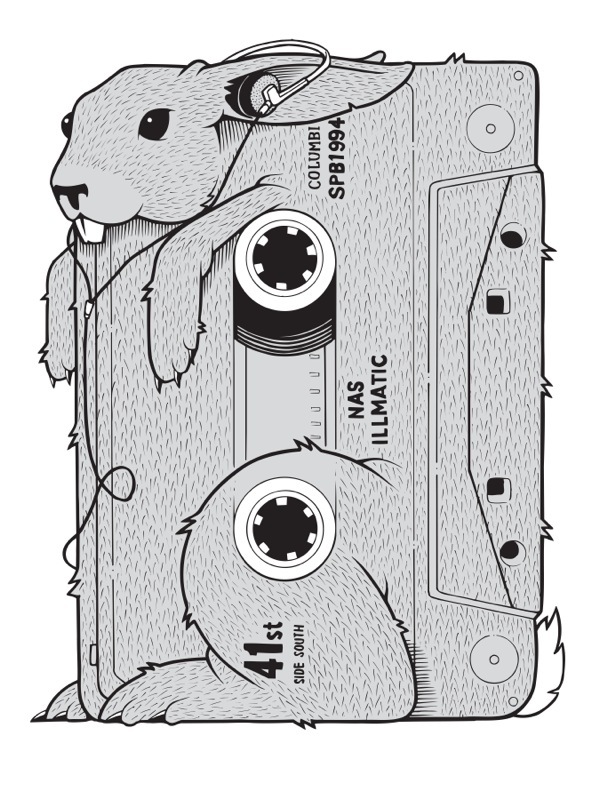 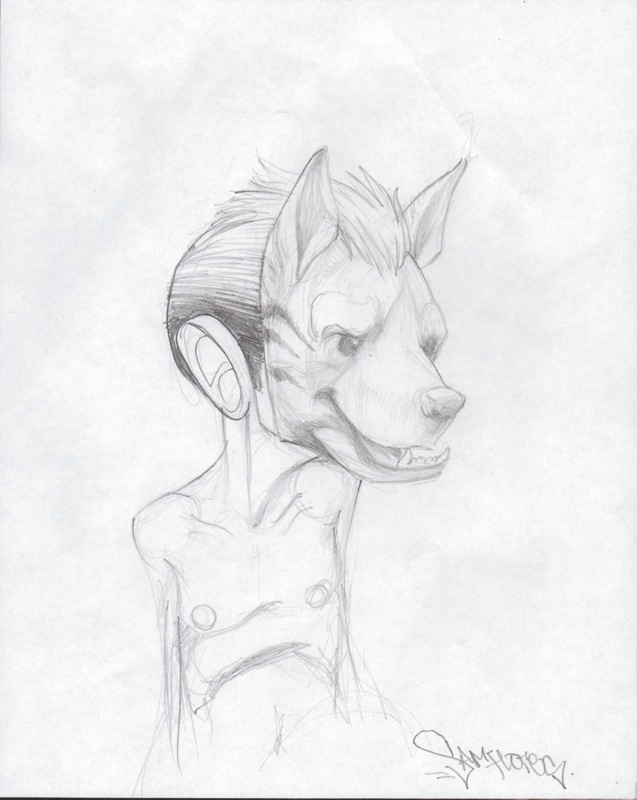 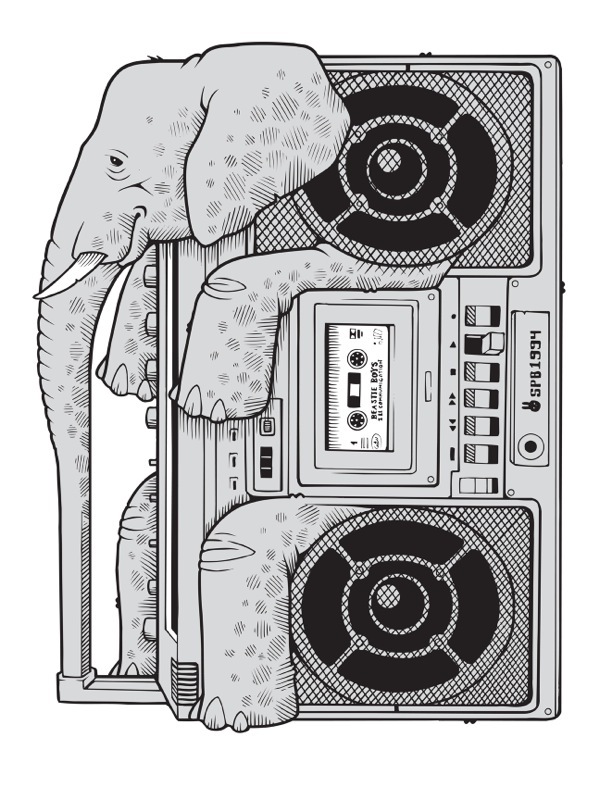 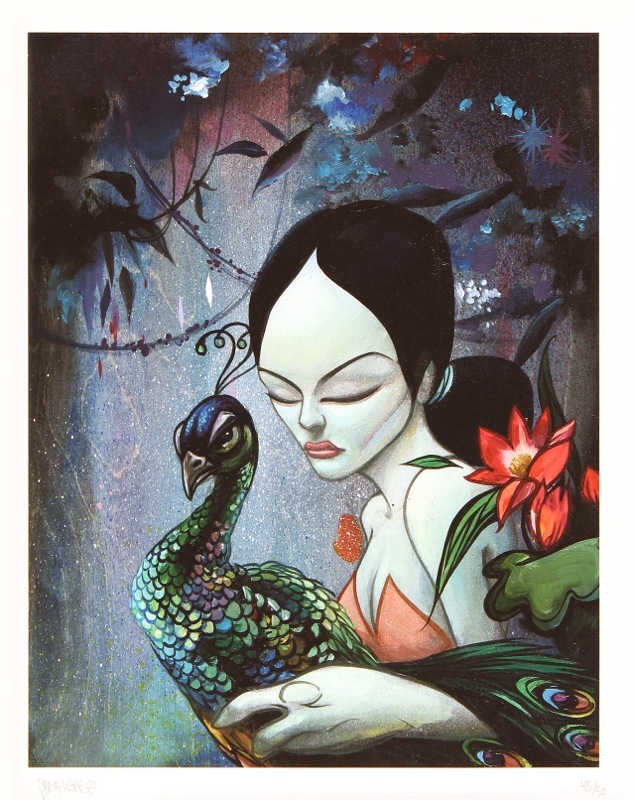 Sam eventually landed in the Bay Area in the late 90's drawn to it's Bohemian lifestyle and also the promise it held for him to develop his career as a commercial artist. 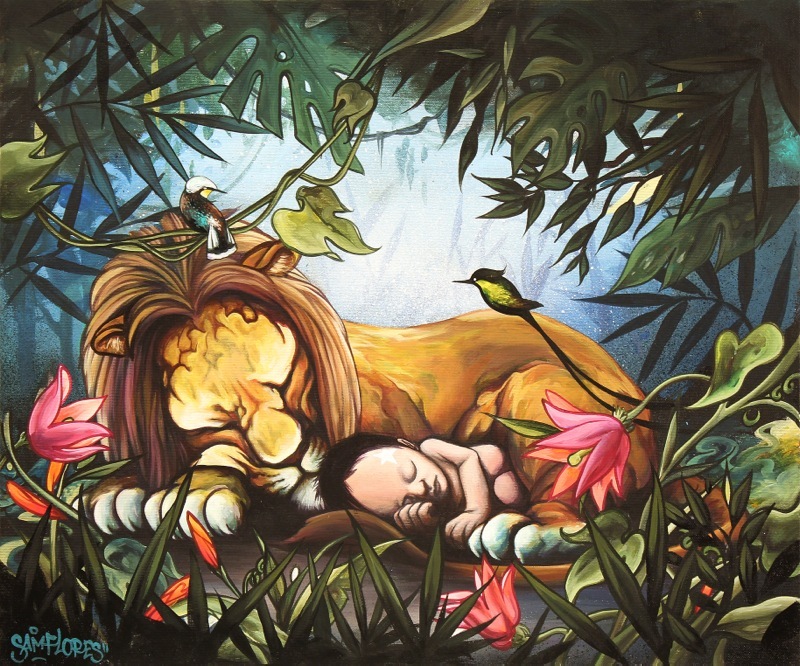 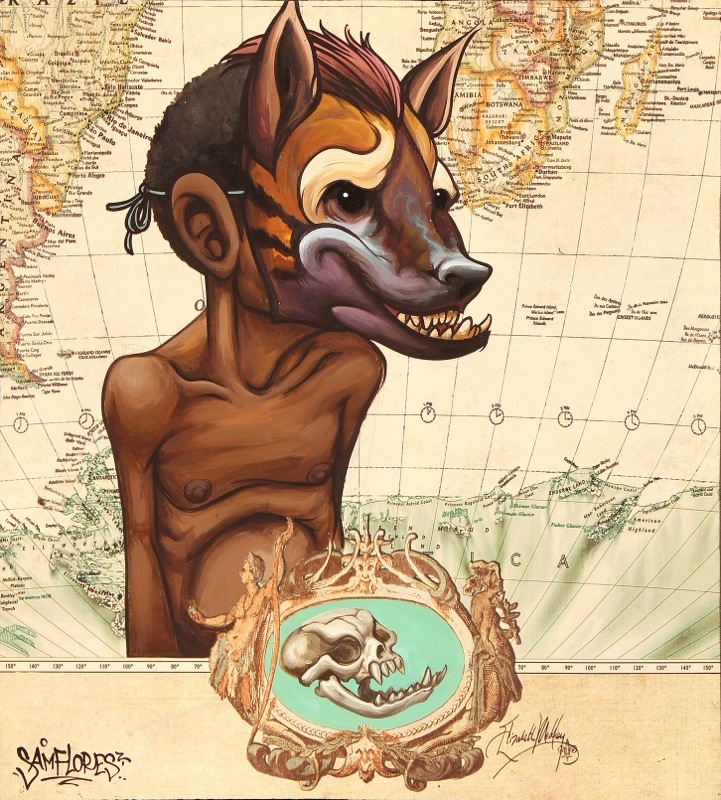 Ever since, Flores has enjoyed an incredible career, developing a passionate fan base while advancing his talent through an ever changing subject matter, often juxtaposed with that of his peer urban contemporary artists, namely because of the presence of themes rarely seen in such genres such as innocence, feminine, natural beauty and melancholy sentiments. 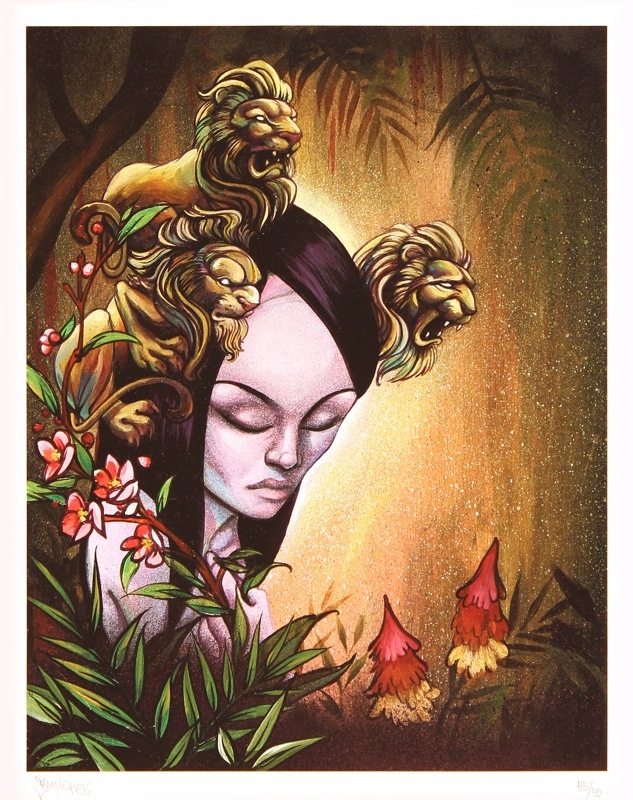 Flores' subject matter includes a myriad of anthropomorphic characters and beautiful goddesses with styles being inspired by Japanese Edo period influenced landscapes, urban contemporary/ graf inspired montages, pop-surrealist environments and his most recent works which are inspired by Mexican pulp comic art and classical portraiture. 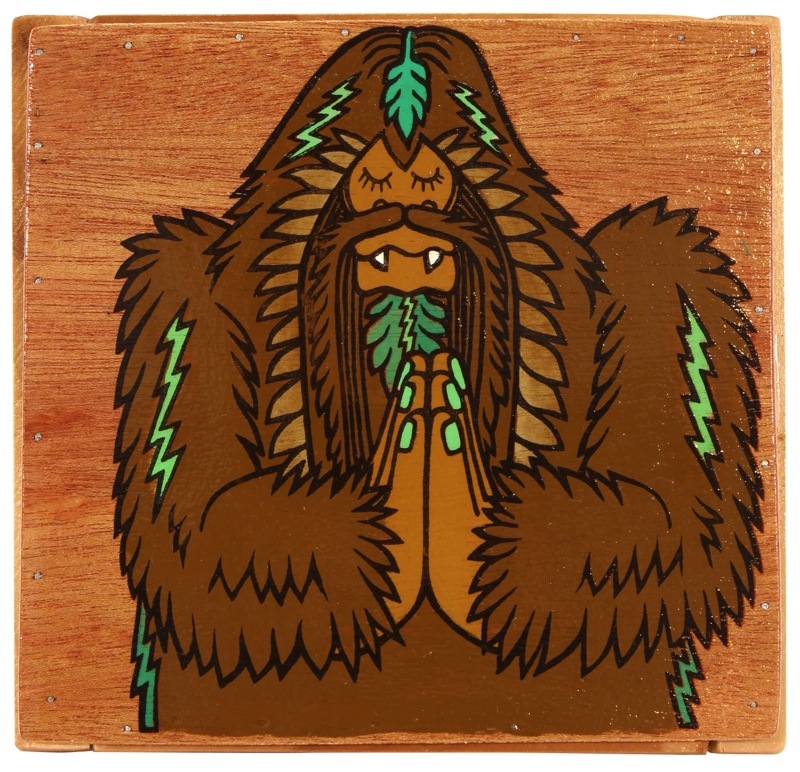 Sam currently creative directs his brand Twelve Grain for Upper Playground, the "12" representing his original crew in Albuquerque and the "Grain" representing the role that nature has played in work and life. 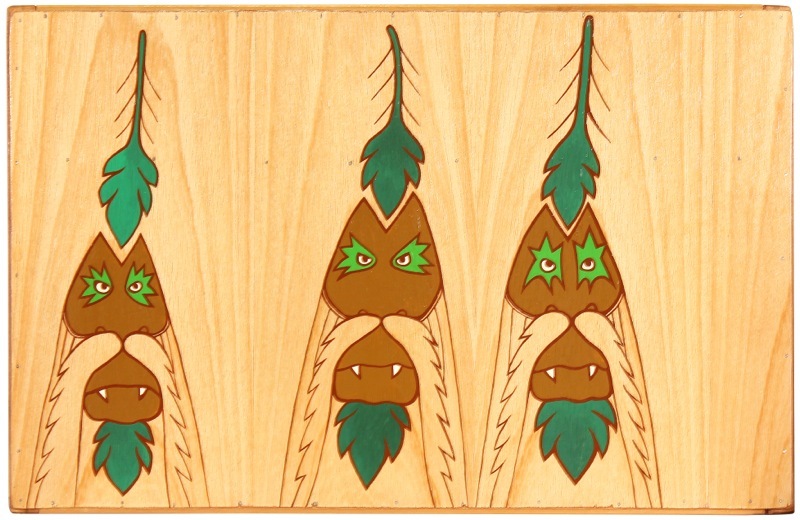 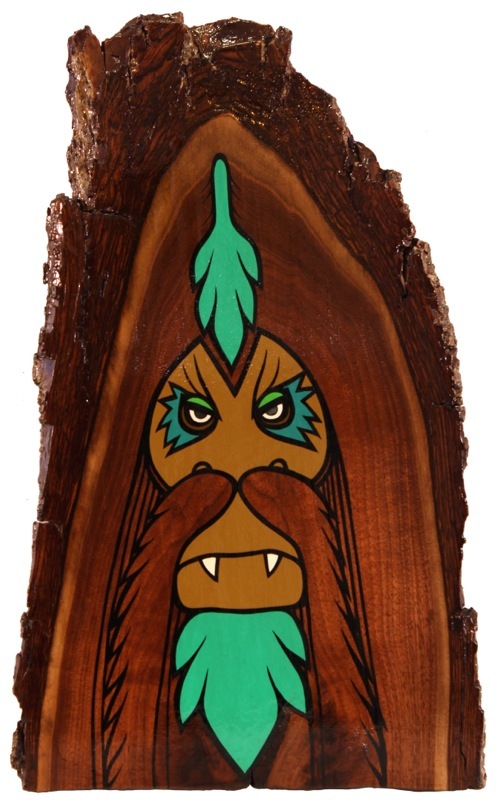 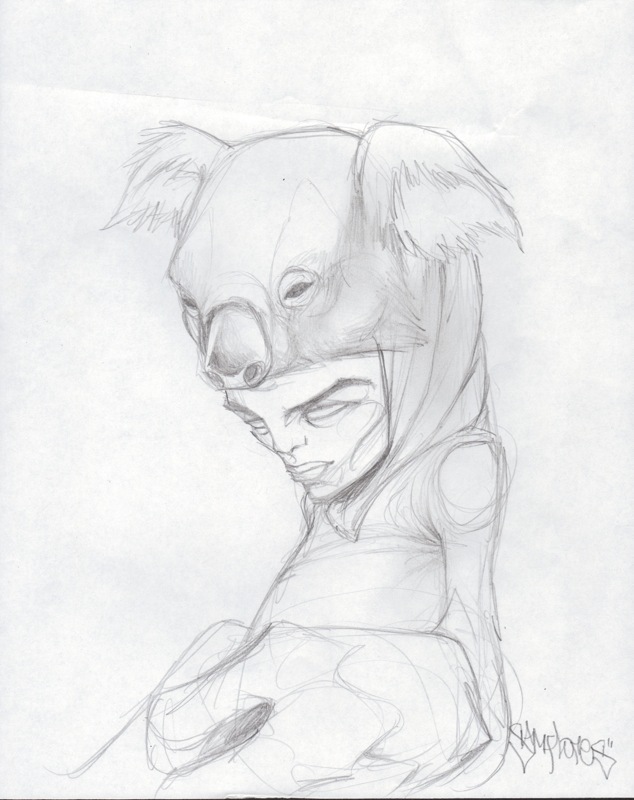 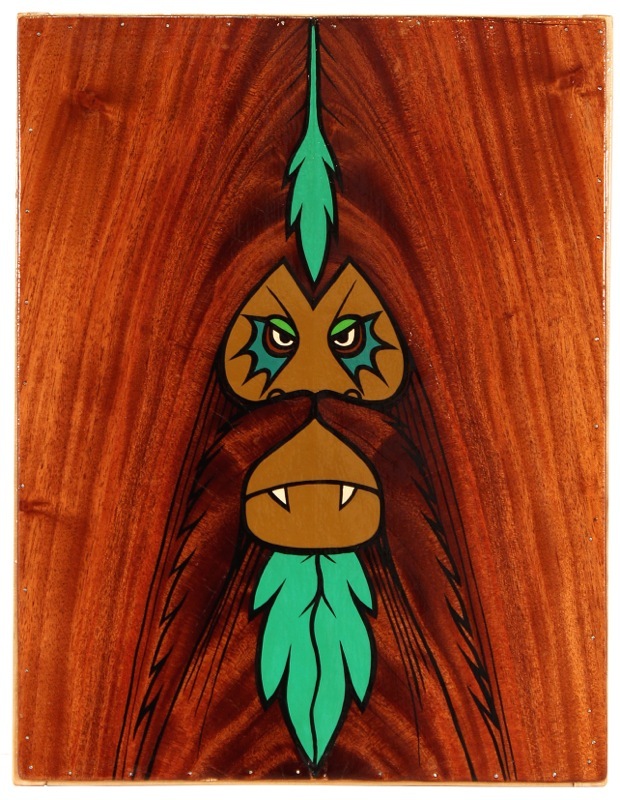 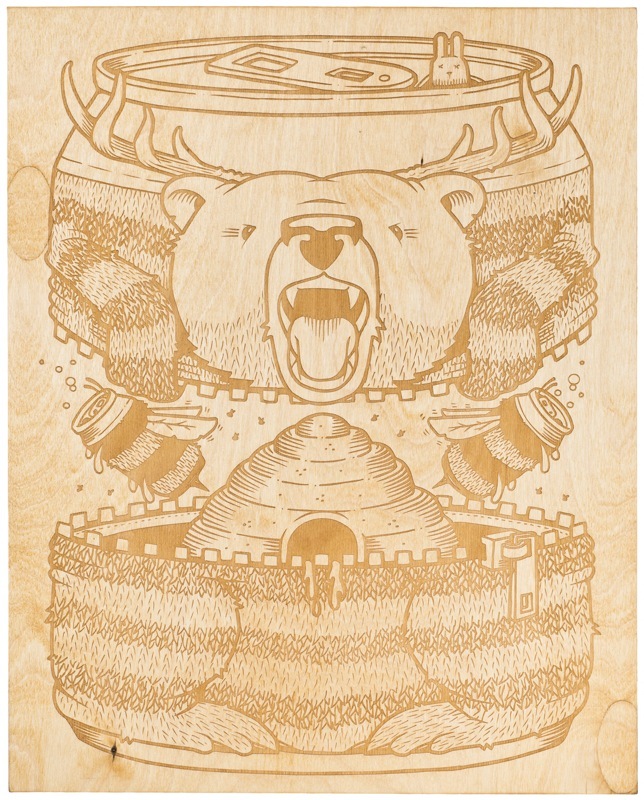 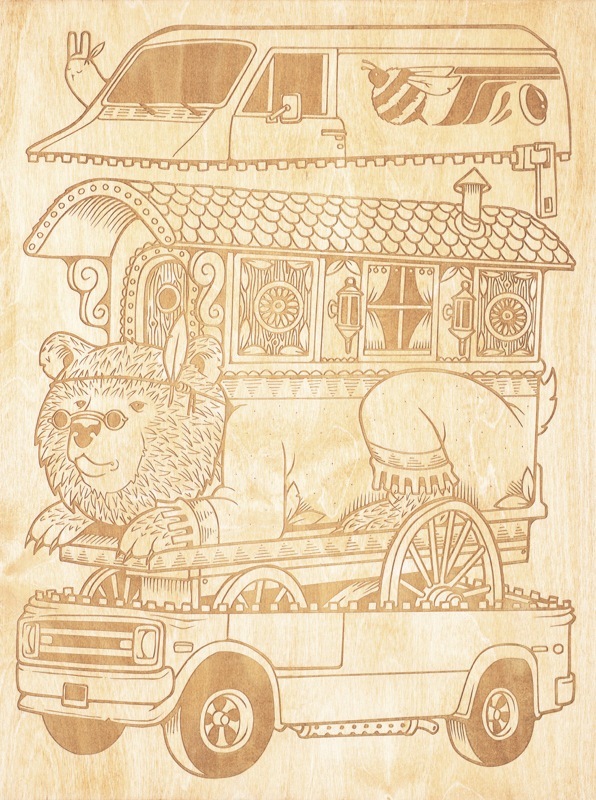 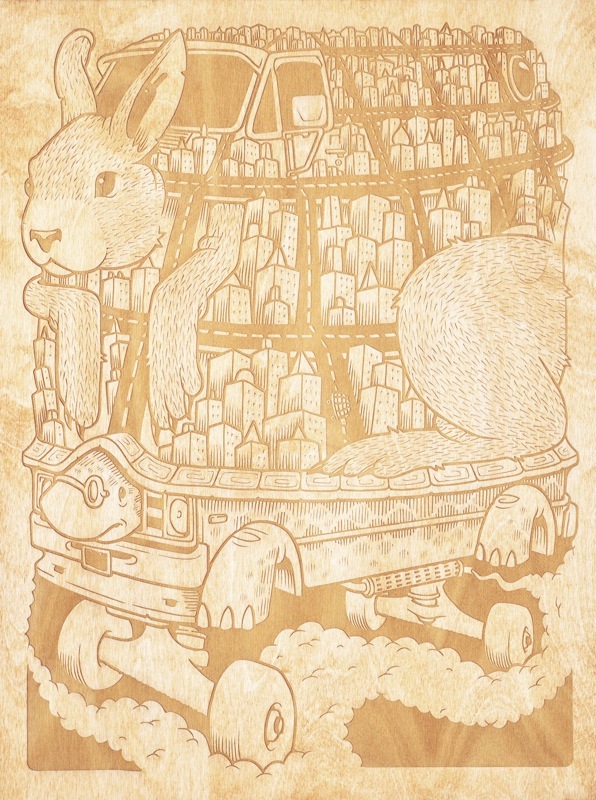 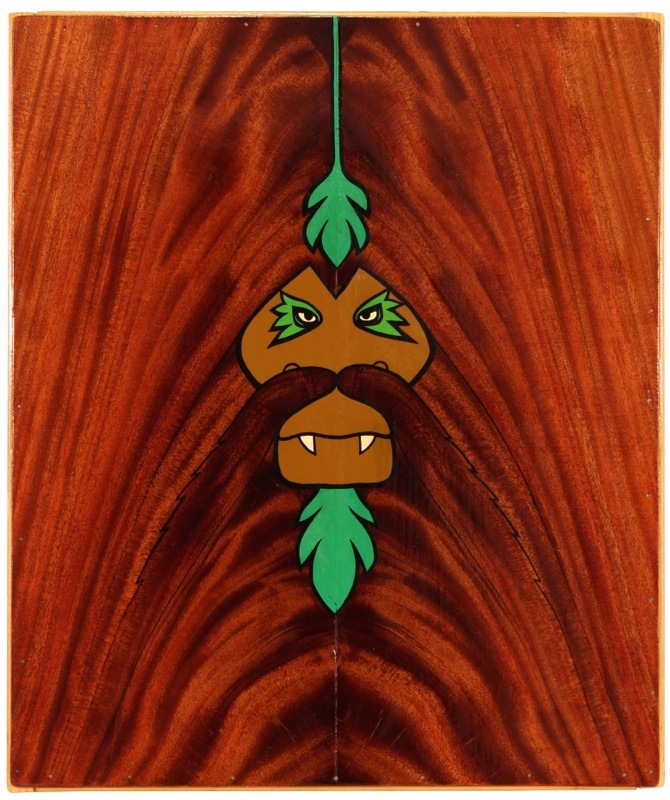 Bigfoot is a California based nature loving artist and has been a influence in the skateboard industry for more than a decade. 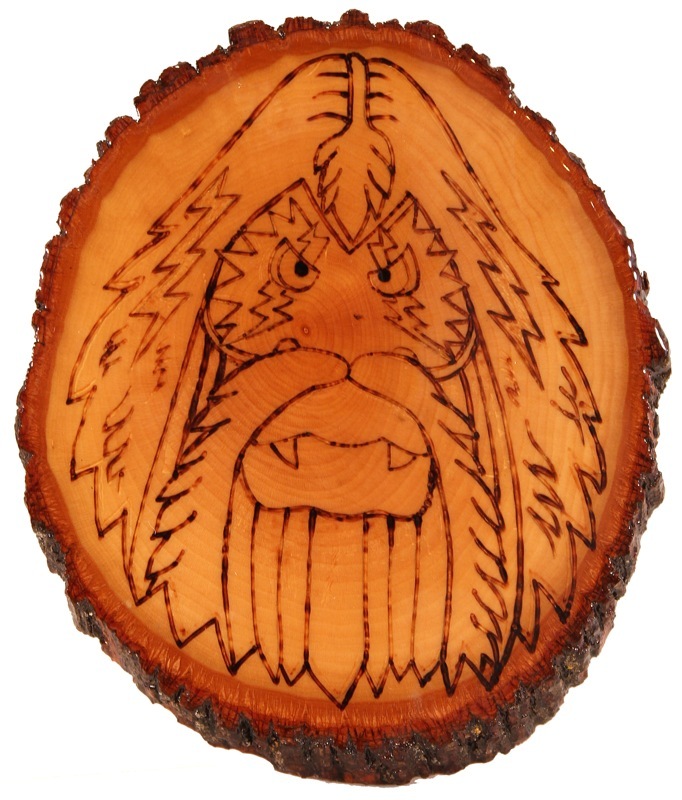 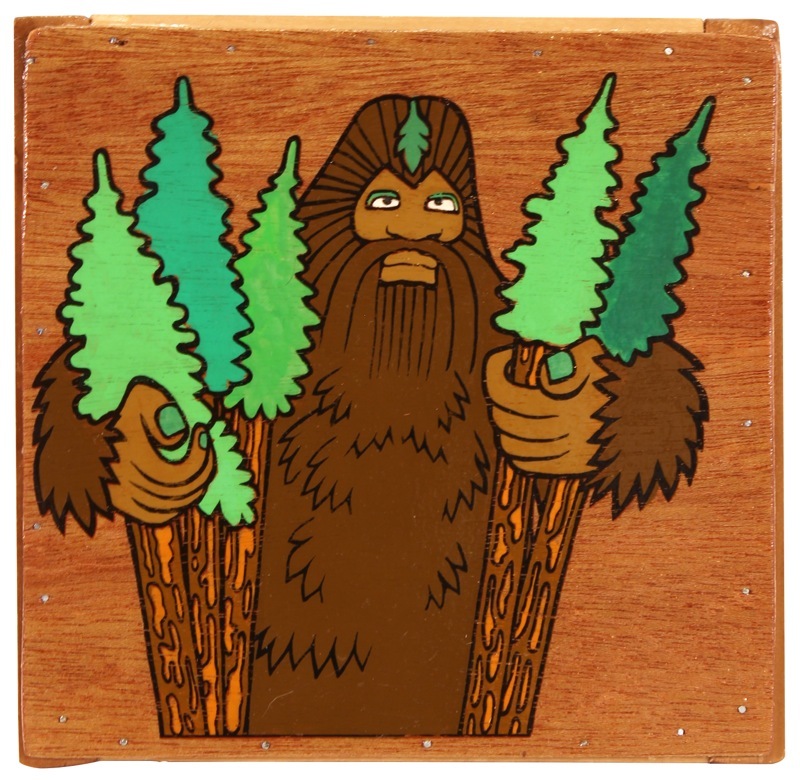 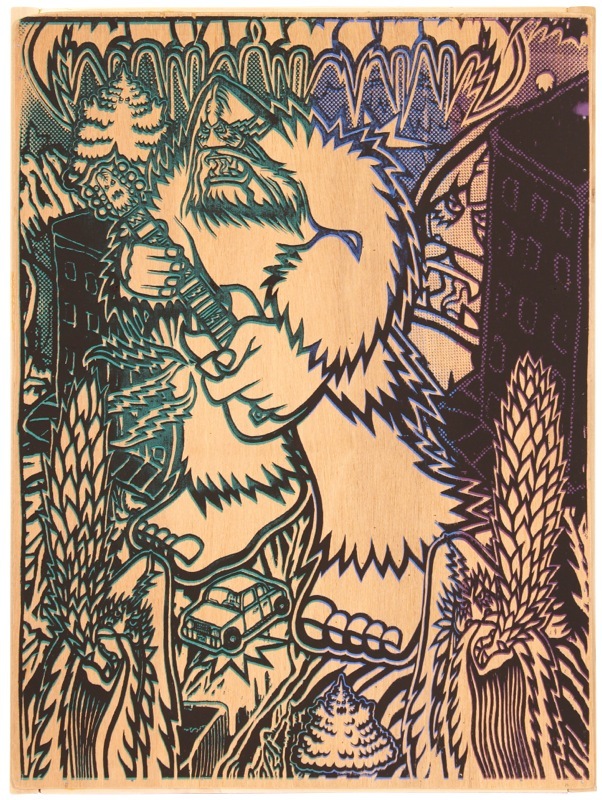 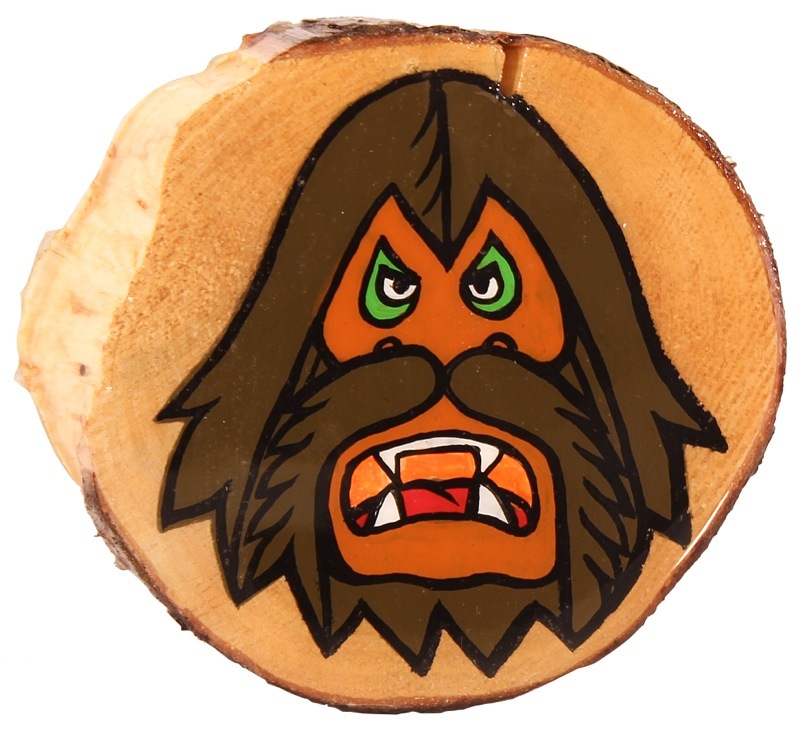 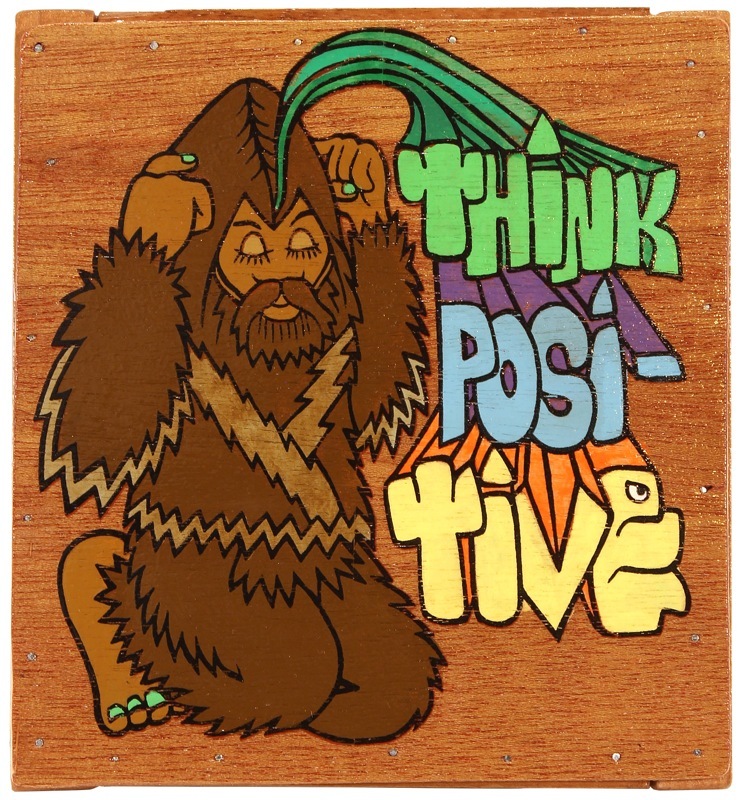 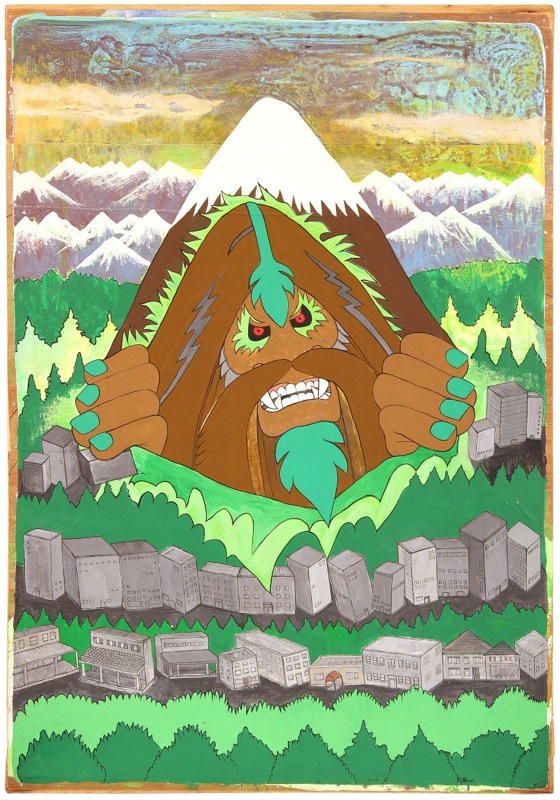 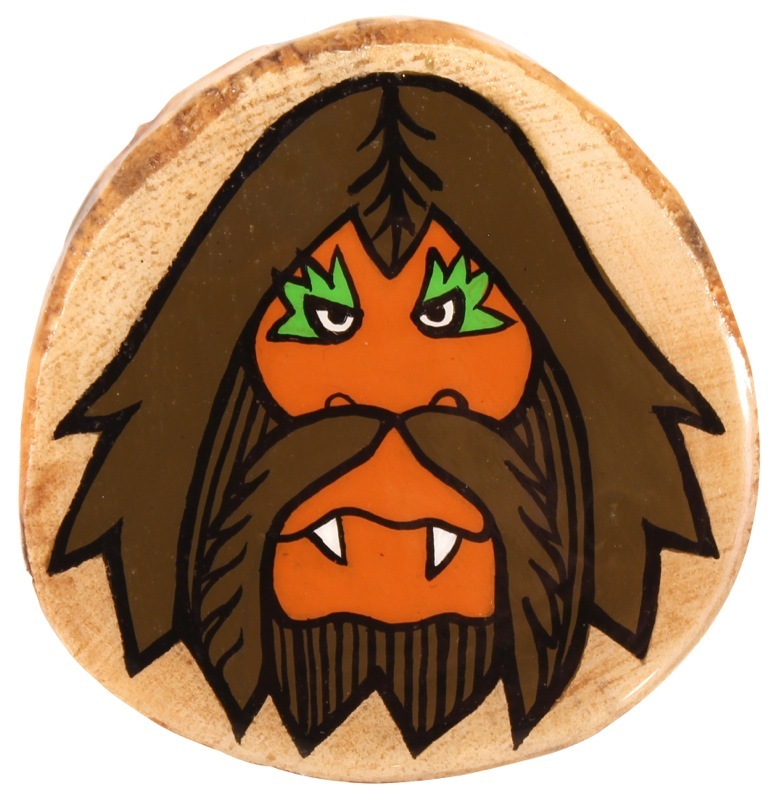 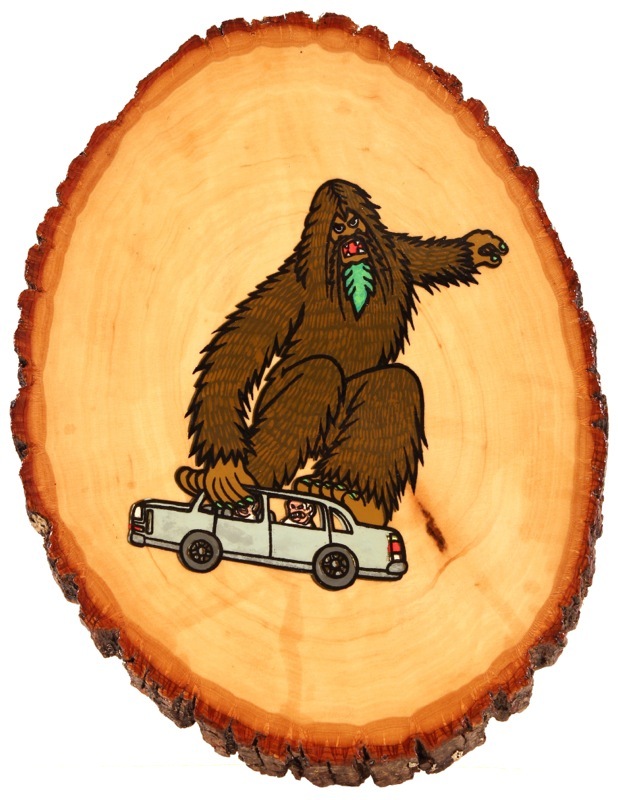 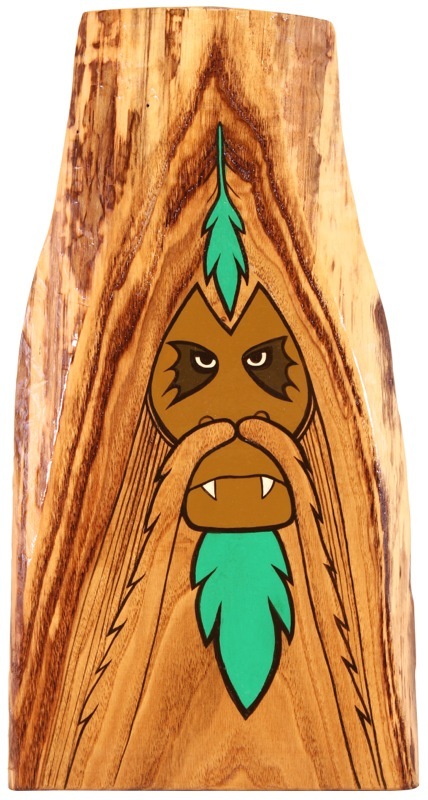 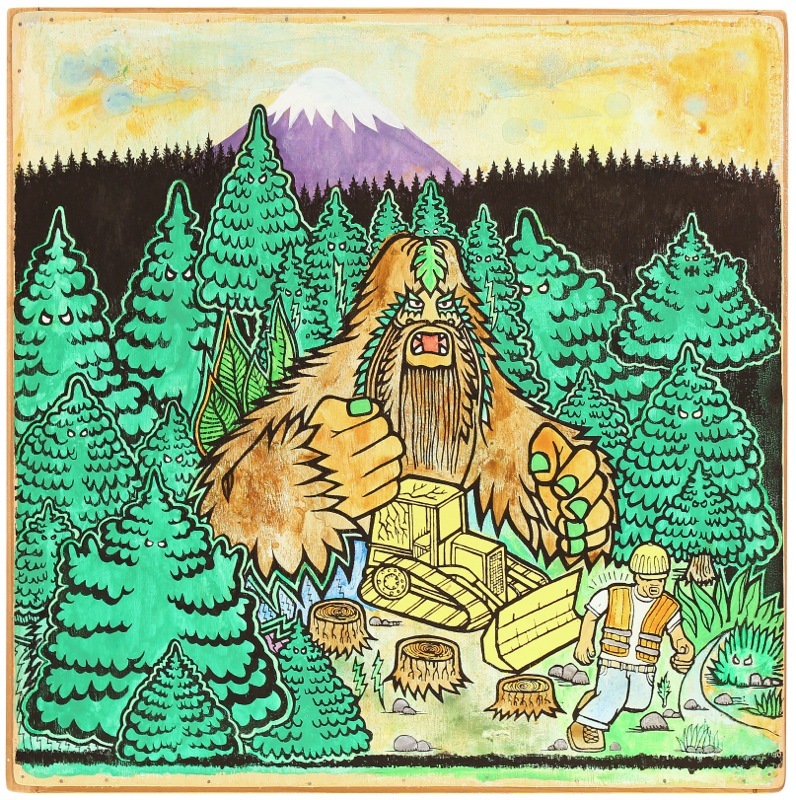 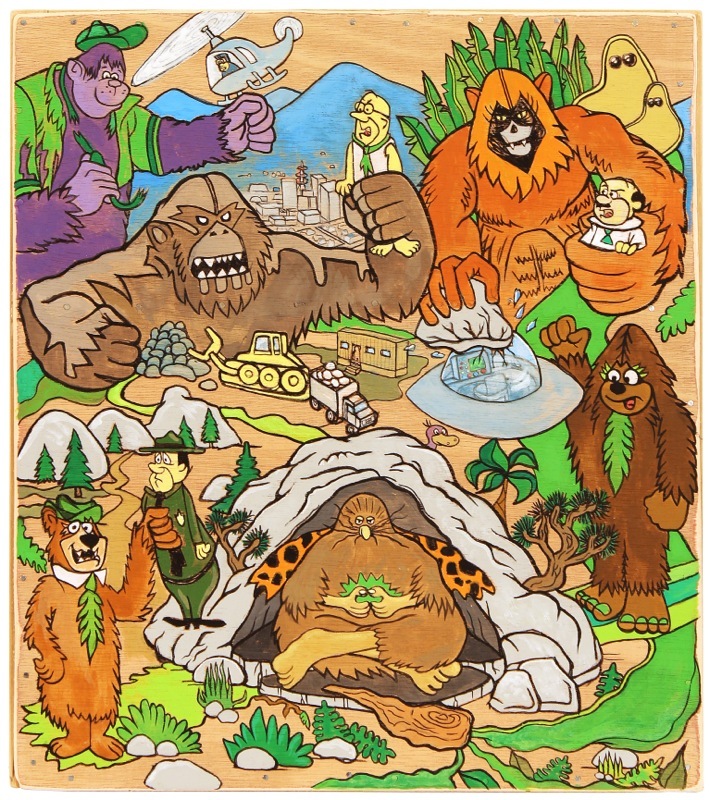 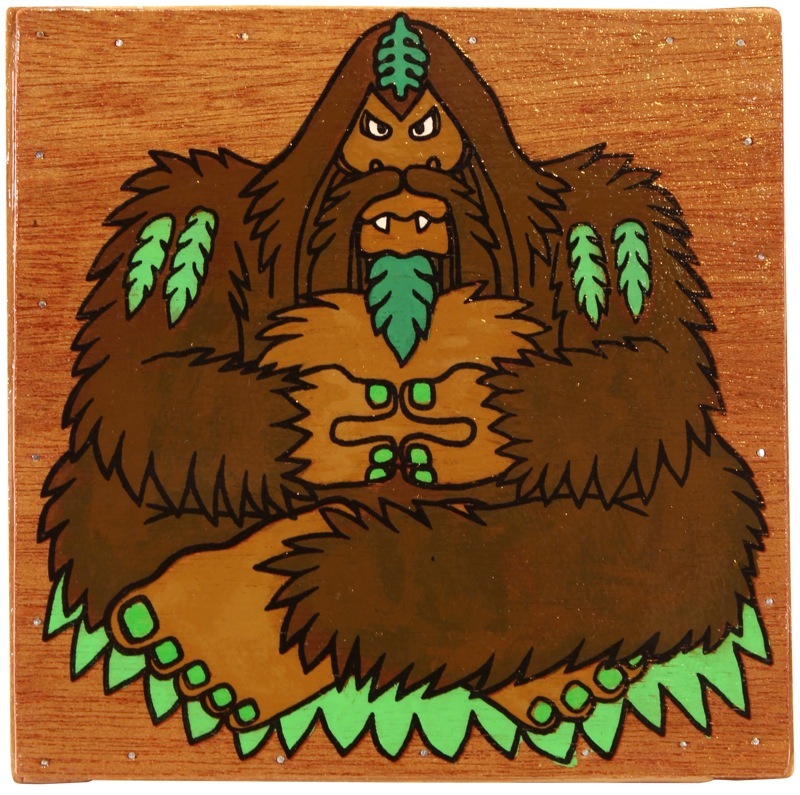 Originally from New Jersey, young Bigfoot fled to California to be closer to big trees and the Grateful Dead. 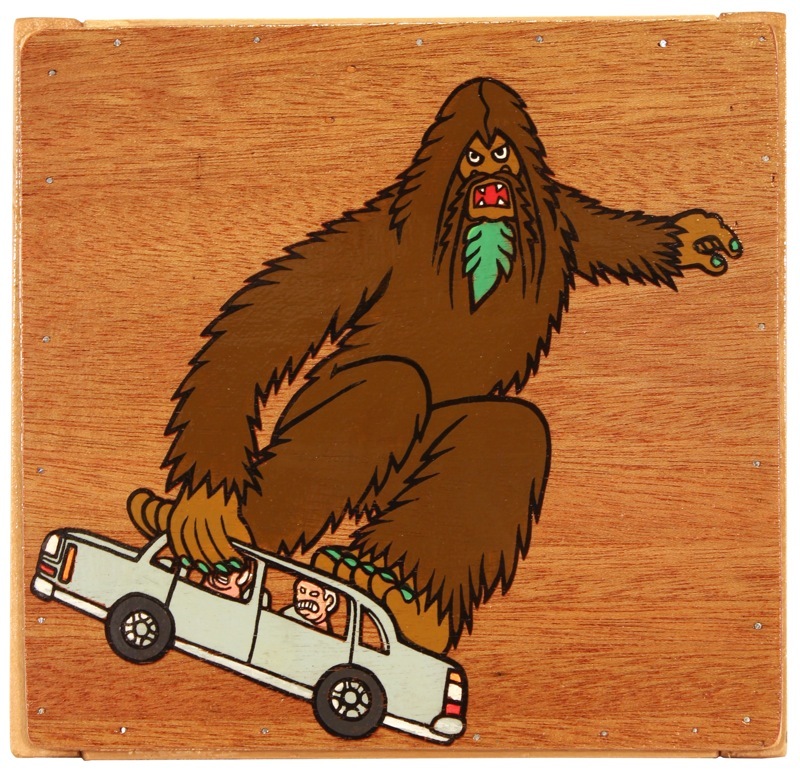 Disassociated from art school and human society, in 1994 he started writing “Bigfoot” in the streets of San Francisco with relentless fury. 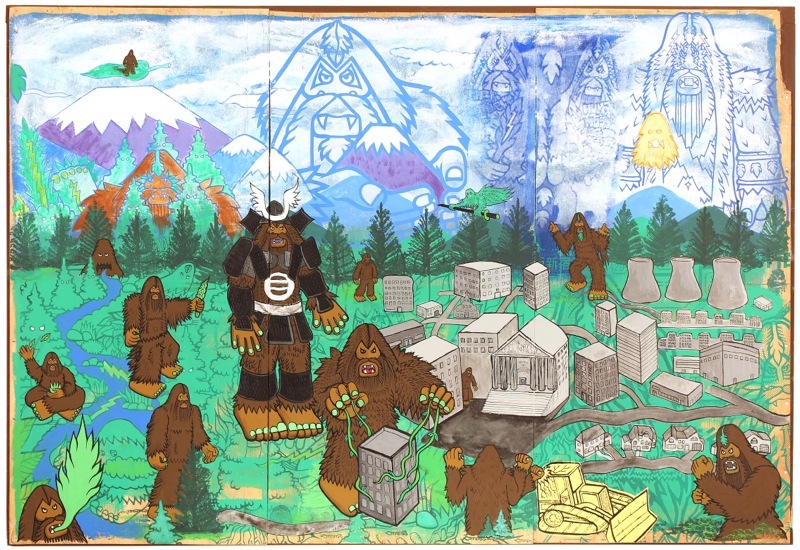 Working often with house paint and wooden panels, his work depicts the conflict between the respect for nature held by the artist’s cast of Bigfoot characters and the destructive agenda of mankind. 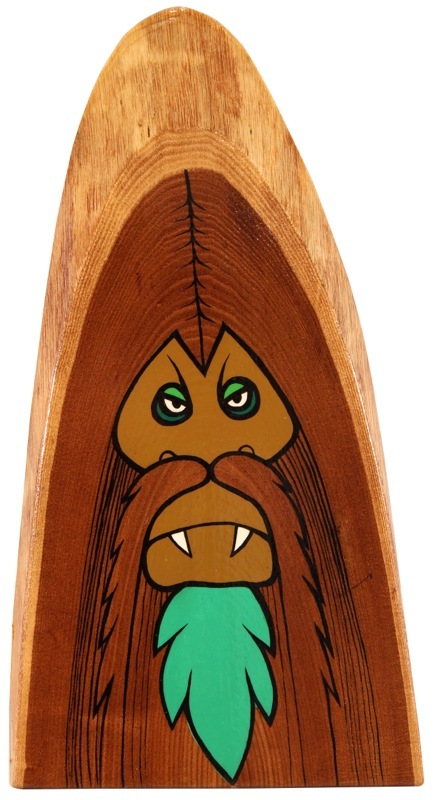 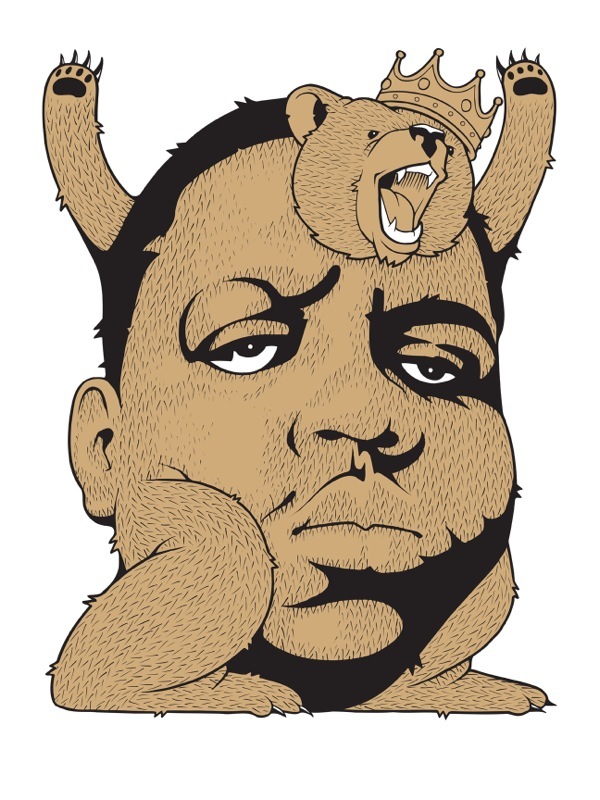 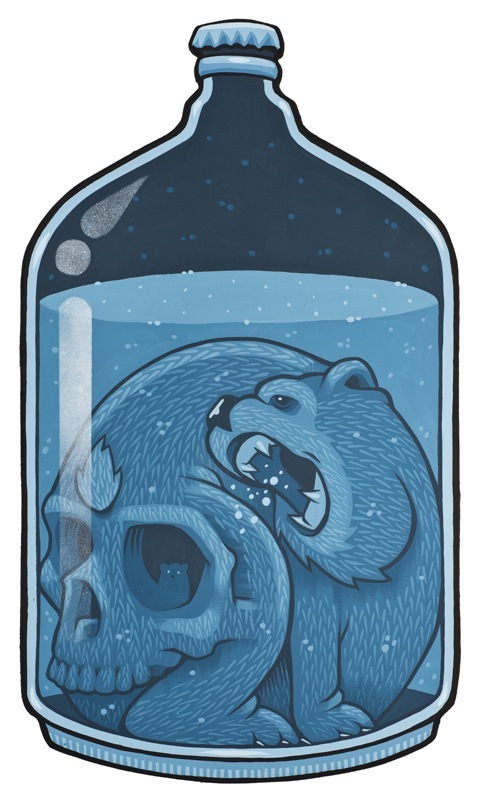 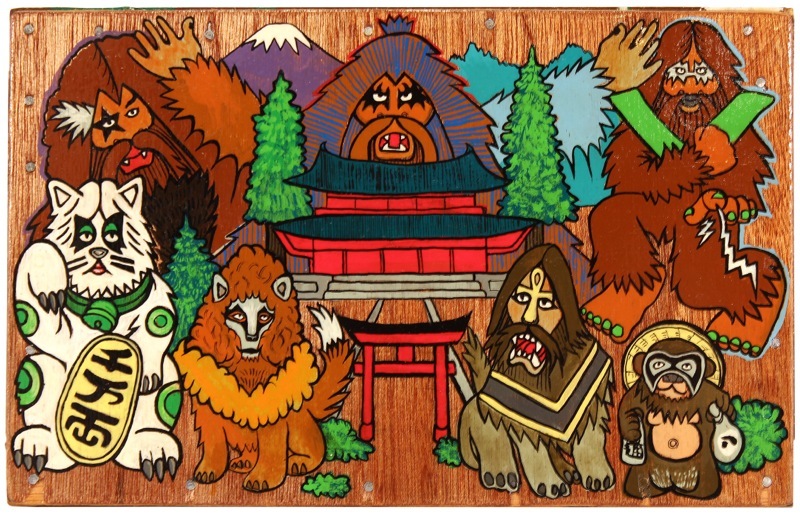 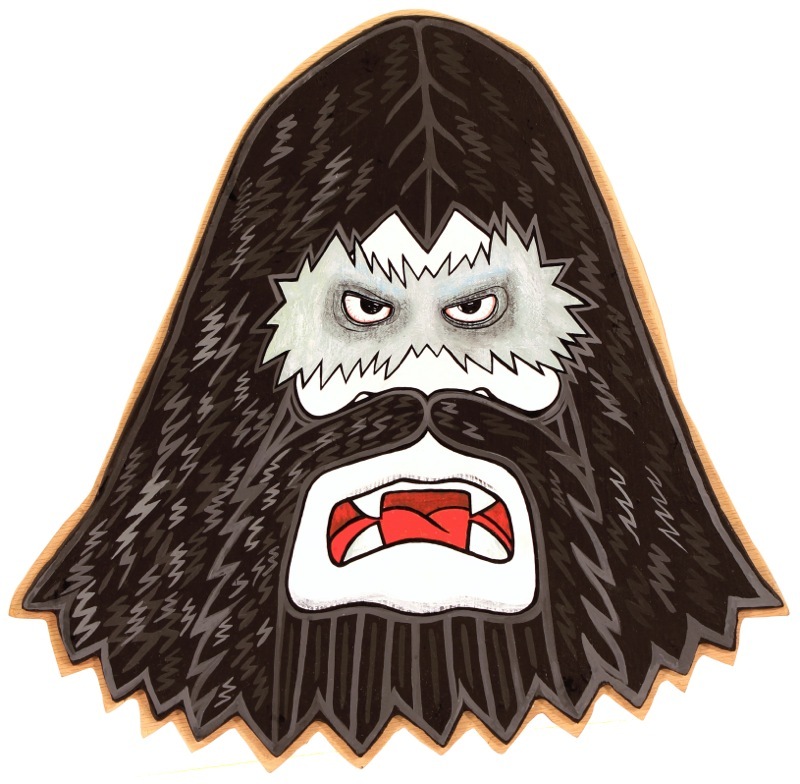 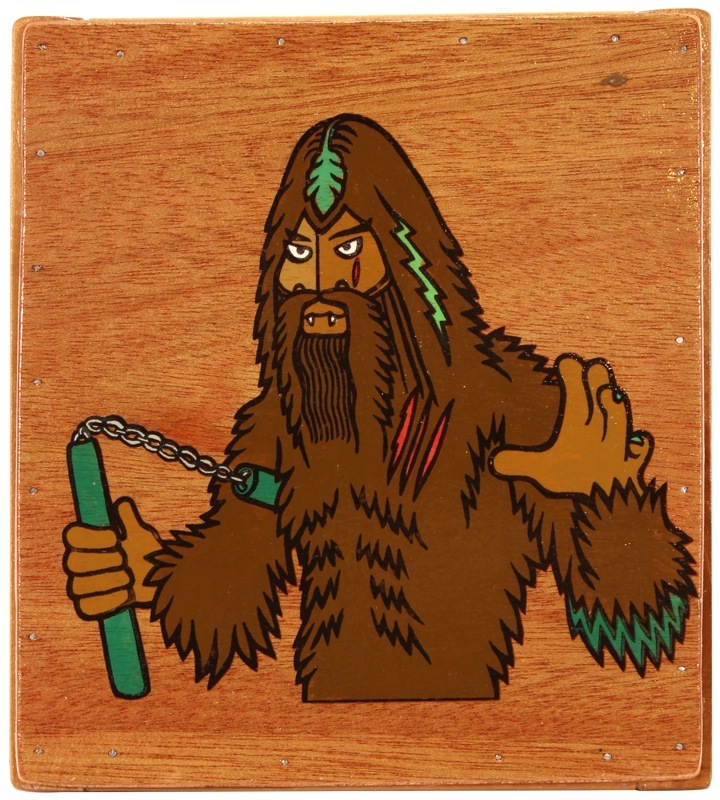 Despite his reclusive nature, Bigfoot has managed to stay active in society, designing skateboard graphics and footwear, showing in galleries in America and Japan, the release of his vinyl figure with Strangeco in 2004 and more recently his collaborations with The North Face and Hurley. 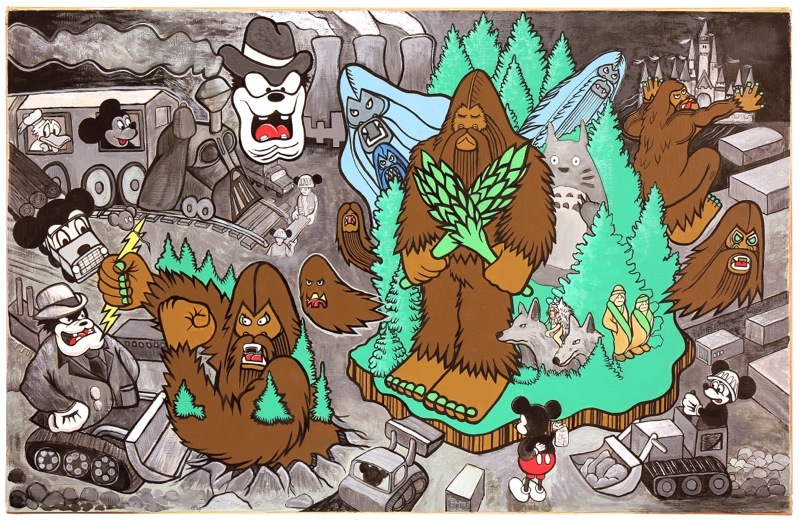 His eponymous character and his love of heavy metal and especially the masked rock group KISS, play a major role in his studio work as well as his highly recognized art. 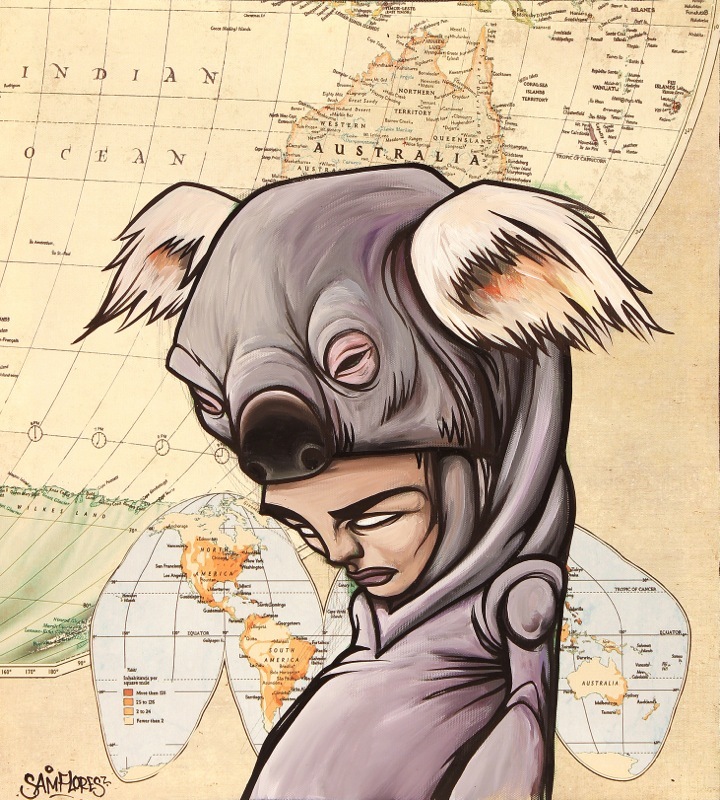 All unsold works from this exhibit have now been returned to the artists.